This story is qwhite bizarre. A teacher in Visalia, Calif., was arrested Thursday on suspicion of felony child endangerment after she allegedly forcibly cut a student’s hair in front the class while loudly singing the national anthem. 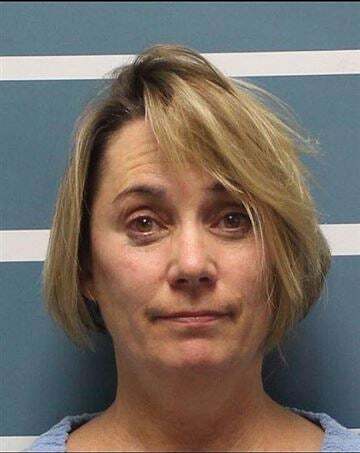 According to NBC News, Margaret Gieszinger is a teacher at University Preparatory High School, located on the campus of the College of the Sequoias in Visalia. In a minute-long video posted to Reddit on Wednesday, she can be seen cutting a boy’s hair and belting out the “Star Spangled Banner” in a classroom. NBC confirmed with College of the Sequoias Chief of Police Kevin Mizner that the video was real. In the video, Gieszinger is standing and a male student is sitting in a chair in front of her. She is haphazardly cutting chunks of his hair out and tossing them behind her as she sings the national anthem. Students in the classroom can be heard expressing their shock. When the student gets up to leave, Geiszinger asks for another volunteer. When the students balk at her request, she threatens to pick someone herself. She then walks over to a female student with long hair and takes the student’s hair in her hands. The student says “No, Ms. G,” and the students in the classroom run outside. Tulare County Superintendent of Schools Jim Vidak released a statement Thursday saying that counselors were sent to the school for students in the wake of the incident. “We take very seriously the safety of the students in classrooms and on the [College of the Sequoias] campus,” the statement said. “We move decisively when questions of inappropriate and unprofessional conduct are brought to the attention” of the administration, the statement said and added that Gieszinger had been replaced with a substitute teacher. Gieszinger is currently being held on a $100,000 bond and will appear in court on Friday.